Could use some advice on this deck build folks. The Theros set appealed to the Greek Mythology geek in me so much. I wanted to make a deck that followed that and was fun to play. Then I met Flamespeaker Adept. Oh yeah, almost had a nerdgasm. So I built this deck around that card. I looked for ways to scry to boost him, and there were plenty of red and blue ways. I also wanted to capitalize on the instants and sorceries I would be casting to boost Flamespeaker Adept, so I went with IZZET and thought Guttersnipe and Prescient Chimera. While those are the focal points, I thought putting in the Red God Purphoros and Young Pyromancer could be interesting as well. Still, I found that my biggest issue when deckbuilding is "that I be doin' too much" (my math students say that to me all the time). I guess I try to make a jack of all trades / Batman's utility belt deck that doesn't focus on doing one or two things well. Check out the link on tappedout.net and let me know what you think. Any advice is welcome. For the past several months now I've been going to FNM (Friday Night Magic). I was always intimidated by the level of competition and multitude of Magic the Gathering deck combinations. Still after I started this blog and the corresponding vlog, I decided to venture a little out of my comfort zone. 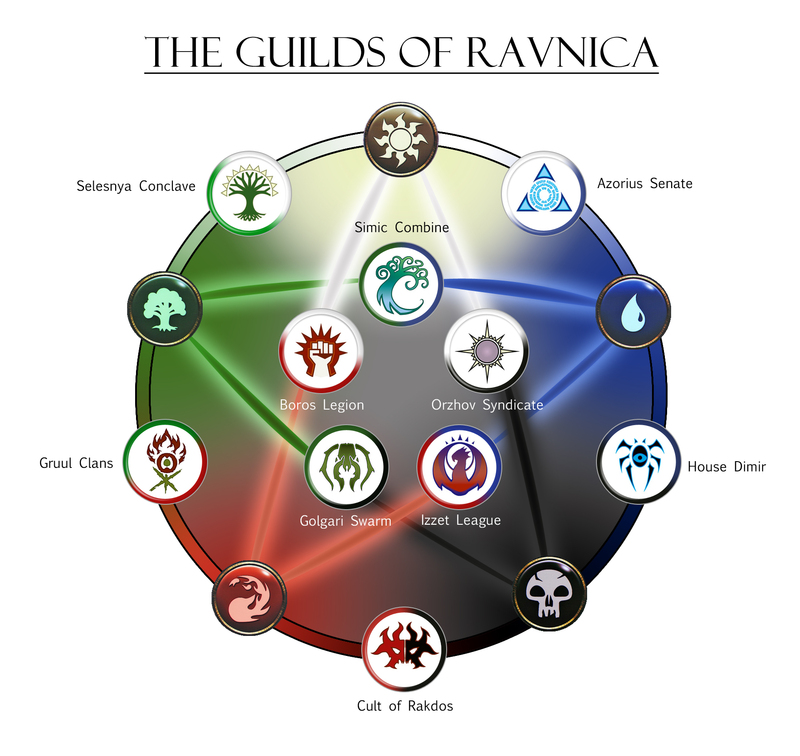 When I decided I would start attending, the Return to Ravnica block had just started and I'd become nearly obsessed with the guilds... The 10 duel color themes that was the Ravnica and Return to Ravnica theme. This infatuation led me to challenge myself with playing all 10 guilds at Friday Night Magic. My intent was to write a series of articles chronicling each of my guild decks and how the game went. I feel a little short (got lazy). While I keep notes, I didn't quite manage to write articles corresponding to each of my Ravnica guild deck games. I also want to preface this by saying I've been playing FNM at a small and at the time relatively new venue. It started having 4 rounds for FNM and has grown to require 5 rounds. I also tried to not spend a lot of money on my decks. I've been pooling resources with friends and students to try and make the best decks without spending a lot. My first Friday Night Magic I played Gruul. By now I decided I was going to play all ten guilds. As I was out to have fun more than win, I tried to use the Biovisionary as my win condition while playing evolve. I never did get it to work, but I did go 2wins-2 losses again. It was fun moving multiple counters around. And this time I didn't just beat my companions. Its rather funny as Blue/Red are probably my favorite color combination but this guild just failed to impress me. I really tried to like it too. I liked playing the guild, but had a terrible time trying to find a win condition. One of my students clued me in on the Nivix Cyclops/Fluzcharger/Unblockable combo. It seemed rather cheesy to me, but I wanted to play the guild so I built a deck around it. Let's just say it didn't work for me. I believe I was 1win-3losses....it might have been 1win-4losses...I can't quite remember, I believe I've blocked that out. I did have fun with the Burning Earth enchantment on all the dual land players. While Blue/Black aren't necessarily my favorite colors, Dimir is my favorite guild. The guild of thieves and assassins...Love it! Unfortunately I had about as much luck with Dimir as I did with Izzet. I didn't have a strong win condition; mostly mill with a few Consuming Abberrations. I had to play this deck then as the Innistrad block was moving out of standard play. This was my last chance to play Invisible Stalkers (what's more Dimir than Invisible Stalkers?). I didn't get a single win, still I had a reasonable amount of fun with this deck. This was the first deck I played using cards from the Theors set. Its creature heavy and played into Battalion. I didn't really have an answer for board wipe, but I didn't face any. The deck did ok against amateur players, but more experienced players beat it down. I ended up 3wins-2losses. I ended up miss using Pithing Needle; thought I could use it on a instant/sorcery to stop it from working. In truth, I didn't have much of a strategy with this deck. I know I wanted to use the populate mechanic along with the Voice of Resurgence, Fleecemane Lion, and Advent of the Worm I pulled. That was it. There was a little life gain in there as well. I did ok; but when I faced a deck with a definite win condition, I didn't have a snowball's chance in Florida. Still it was kind of fun populating and using the Centaur and Worm tokens. Didn't get a chance to make any soldiers with Precinct Captain though. I went 3wins-2losses. I had fun with this deck! Sticking with the theme, this deck uses extort and pseudo extort thanks to black devotion and Gray Merchant. The Triad of Fates allows me to pop the Merchant in and out for continued pseudo extort. The deck worked except my first game was against a deck full of planeswalkers and I got owed. I'm not complaining though, I had a blast! I ended up with 4wins-1loss, got 3rd place. That's a first for me.